Appearance 2. Introduction Speech. This segment will be done in full school uniform. The introductory speech should include hobbies, interests, life ambition, information on school, promo of sponsor. Time allotted for speech is five minutes. Total ………………………………………………………………… 45pts Appearance 3. Talent. Any talent that brings out the best in contestants performance. It should focus on any aspect or aspects of the school-past, present or future. It should depict something positive, not offensive. Talent performance can be single-dance, drama, song, music or a combination of these. Allowed time 10 minutes or less. NB. A performance does not have to be long to be good. Appearance 4. Creative Caribbean Formal Wear. A formal ankle lengthed gown to be used in a Caribbean formal setting. Fabric should be of any of the following – floral or plain cotton, tie-dye, batik, linen, crocus or a combination of these. However, fabric painting and glittering fabric paints are allowed. The dress should not be revealing – no low cut bustline, backout, see through, high split etc. A question and answer segment-forms part of this appearance. The pageant takes place on Saturday 12th July at 7.00 p.m. @ the Gingerland Primary School Grounds. Admission is $20.00 for adults and $10.00 for children. The event is organized by the Junior Achievement (JA) club at the school. 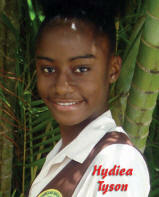 The chairperson for the organization committee is Junior Achiever Miss Rondee Pinney, a student of Form 4a2.